I'm sure I don't need to say this, but what the people in this video are doing is very, very dangerous. 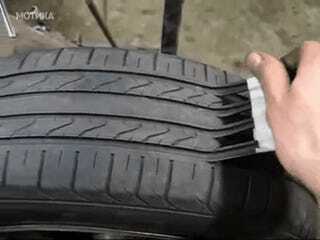 It should by no means be used as a method of giving your tires a new lease on life. Tires are a wear item, and need to be replaced when their time is up. What these guys are essentially doing is stripping away all the rubber from the face of the tire and leaving it uncovered. This leaves the tire much more exposed to punctures and blowouts, not to mention that the "eyeball" method of cutting tires doesn't really make for the most consistent performance. Do not try this at home, or anywhere else. This is stupid.